Lauren Stiles has helped thousands of people with the day-to-day operational challenges of running a small business. When you work with Unique Directions in Training for keynote speaking engagements, you're not getting an ordinary presentation. Lauren Stiles is known for her ability to truly connect with audiences, sharing stories and anecdotes that hit home and have a huge impact in helping them solve their problems. At the end of a keynote presentation your audience will leave motivated and inspired to make change, and will also have the tools and resources to make that change happen. With Laurens educational and entertaining style, you'll laugh and have fun while you learn the skills that will lead to your ultimate success. Take a unique direction with your next keynote presentation or training with Unique Directions in Training. You're not getting an ordinary presentation! At the end of a keynote presentation from me, your audience will leave motivated and inspired to make change and will also have the tools and resources to make that change happen. We take a unique angle! At Unique Directions in Training, I view my jobs as trainer much differently than most in my field. My approach is to make the training experience personalized, addressing the challenges and issues that are impacting your business right now. Address the issues facing your business! My clients benefit greatly from more one-on-one consultation to meet your precise needs. I work directly with you to find new ways and ideas to improve your salon operations. If you're tired of listening to speakers drone on as they stand behind a lectern, then Unique Directions in Training is the solution for you. In our sessions, you'll work in groups through an experiential process. A trainer and consultant who motivates people to make the change they need. Lauren Stiles has helped thousands of people with the day-to-day operations of running a small business. 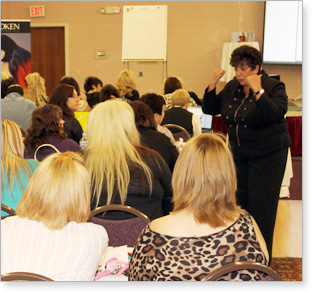 Her experience in the salon industry makes her a trusted, valuable resource for salon owners and managers.